You will soon discover the new 2019 Lexus UX at Spinelli Lexus, the Lexus Pointe-Claire dealership located near Downtown Montreal. Obviously, the SUV trend does not seem to fade at all; on the contrary, it is more alive than ever. Lexus, Toyota’s upscale segment introduces to us this year the brand-new 2019 Lexus UX that will arrive at your Spinelli Lexus dealership in Montreal, near the West Island, between Laval and the South Shore of Montreal, in the fall of 2018. It was at the 2018 Geneva Motor Show that the most recent Lexus made its world debut. This compact multi-segment has a wonderful design, both outside and inside, and it promises an enthralling performance and innovative technology. The driver-centric cockpit concept is outstanding and the exceptional finish quality as well as the attention to detail are equally important. The fittings were inspired by Japanese handmade paper. The new 2019 UX is the first Lexus vehicle to be built on Toyota’s new global architecture which offers the lowest centre of gravity in its class and an exceptionally stiff body to maximize agility. It is powered by a new 2.0-litre gasoline engine and a continuously variable Direct Shift transmission. Also worthy of mention is the new UX 250h, which features the new 4th generation hybrid electric system that is both more powerful and more efficient. The F SPORT versions, on the other hand, add performance features such as a sport-tuned suspension and high-performance rear shock absorbers for even more agile and precise road handling. It’s the Lexus+ security system, an advanced set of security technologies that will be found in the new 2019 UX. It includes a pre-collision system that can recognize pedestrians in the dark and detect cyclists by day, the Lexus CoDRIVE driver assistance function, which includes Lane Keeping Assist and Adaptive Cruise Control, as well as the Automatic/Adaptive Headlight System. Without any doubt the new UX is mesmerizingly enticing, but we will unfortunately have to wait until the fall of 2018 before being able to try it. It’s a safe bet that the city-dwellers of Montreal and the West Island will run wild for it, as well as the suburbanites of Laval and the South Shore of Montreal, because it is simply magnificent. 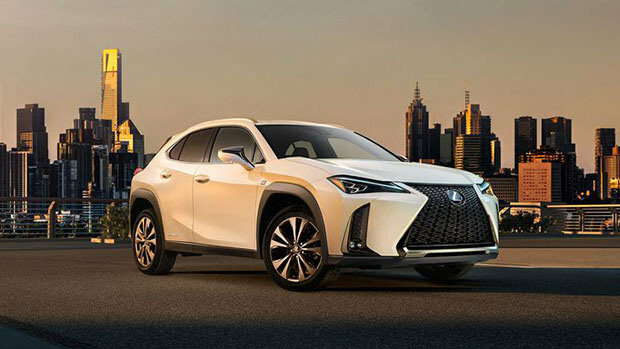 Nevertheless, if the waiting becomes unbearable you can always learn a little more about the new 2019 UX by visiting us at your Spinelli dealership which offers you, in addition to Lexus financing, interesting offers for promotions. Come and see us!